We are only a few weeks away from the Olympics and the suspense is building. As I've said before, each night as I watch the TV coverage of the torch relay I get teary-eyed. The Olympic torch landed in Vancouver way back in October and made its way north and east. Once it reached the east coast of Canada it turned around to make the homestretch run back to Vancouver. On January 12th the torch went through my hometown. I wish I could've been there but when I watched the TV coverage the night of the 12th and saw all of the people lined up and down Main Street in my hometown showing their enthusiasm for the torch runners I felt like I had been there. Luckily my mom was there with the camera snapping pictures for me! By the time the torch gets back to Vancouver there won't be a corner of this country that it hasn't touched or inspired. It is a unique feeling to be a part of this. My good friend Kelly that I used to pump gas with back in the uni days in Saskatoon has got the enviable job of working in the athlete's village in Whistler during the Olympics and Paralympics. His pictures, stories and enthusiasm is catching and if you do one thing, then follow he and his wife's blog here. Cheer us on in Vancouver in 2010! So I've been thinking lately of posting about Edmonton (where I live) in a similar fashion to the way we structured the "Dave Special" posts when we were in Australia. Edmonton is a beautiful city with a lot to offer and I'd love to be able to update with photos and stories whenever I encounter something beautiful and unique about Edmonton. I'm going to start off with West Edmonton Mall which has defined Edmonton for nearly 30 years now. When I was growing up in Saskatchewan all I ever wanted to do was go to visit West Ed. Why? West Edmonton Mall at one time was the biggest mall in North America. Done in three phases it houses a full waterpark (waterslides, wave pool, hot tubs), a skating rink, Galaxyland (with rollercoasters and other rides), a live seal/dolphin show, a shooting range, bowling alley, mini-golf, full IMAX theatre and a hotel along with countless stores, restaurants and an Asian supermarket chain. You can literally come for a week and not discover all this mall has to offer. My parents came and experienced West Ed for their first time ever (well my mom was there for an hour once), and stayed at the Fantasyland Hotel attached to the mall. They have themed rooms that you can stay in so my parents spent three nights in one of the Polynesian rooms. It's kind of hokey (and in dire need of a renovation), but it still draws people in by the masses. The last five years I had been brainwashed to believe that birthdays weren't important occasions. I had even stopped putting effort into my own birthdays. 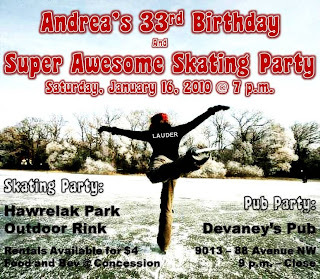 This year I decided to bring birthdays back in a big way and with the help of my roomie Natalie, we organized a "super-awesome skating party" to celebrate my 33rd. This turned out to be one of the best birthdays I've had in a long time. My PR friends Jason, Aly and Lloyd all came up from Calgary to help me celebrate. We laced up our skates to do a couple of laps around the pond at Hawrelak Park and then went to the pub down the street from my home to imbibe in some beverages. As you can tell there were a lot of people and lots of hilarity. I'm so fortunate to have great friends like these to help me celebrate turning another year older. There is nothing that seems to make winter more quintessentially Canadian to me then getting a group of people together for a game of shinny. Shinny, or pond hockey as it is known, can be played on a pond but today we took our game to one of the outdoor rinks in the community. I was the only girl playing today and I was a little apprehensive as I hadn't picked up a stick in over 10 years and hadn't skated in two. I didn't need to worry though ~ all of the time I spent rollerblading this summer helped me get right onto the ice and into the game with no difficulties. It was a warm day today and we worked up a good lather trading passes, insults and scoring goals. I gave up the ghost after an hour but I'm so happy I put my skates on and got out there for a game. It helped me recall my glory days playing ringette in my hometown and playing recreational league hockey in university. This is just one more reason I love winter! New Year's can sometimes be so exciting and sometimes it can be such a bust. Years ago I stopped putting much enthusiasm or planning into New Year's Eve celebrations because they always seemed to disappoint. This year was a great celebration thanks to Mike and Angie opening up the doors of their home for a New Year's get-together with all of their friends. As celebrations go it was fairly low-key: we watched the New Year's Eve battle of Alberta hockey game (Calgary Flames vs. Edmonton Oilers), watched Canada narrowly defeat the USA in World Junior Hockey, had a dip in the hot tub, played some adult snakes & ladders and rang in the new year with some champagne and hugs all around. Happy New Year everyone and I hope 2010 finds you in good health and brings you much prosperity! Not wanting to break the sporting event streak I seem to be riding I couldn't resist checking out some of the action with the World Junior Hockey Championships currently taking place in Saskatoon. I didn't actually make it to any of the games ~ those were sold out long ago, but my good friend Lloyd convinced me to come out to World Fest, the nightly cabaret. Lloyd works for Hockey Canada and has been living in Saskatoon pretty much for the last month preparing for this tournament (explains why he didn't make the PR Christmas party). Anyway we called up another PR classmate, Rachel, and went to check out Canadian music legends, Trooper, as they rocked the stage! It was great to catch up with Rach, Lloyd and my friend Shyanne. I think the next big Lloyd event will be his annual birthday curling funspiel at the end of January (am I right? )!